Killed In Action, 23 October, 1916. John was born in Crieve, in Longford, sometime in the mid 1890’s (see note), to Robert and Jane Manson. His Mother died when John was young, as his Father was a widower by the time of the 1901 Census, at which time the family was living with his Gt. Aunt at 177 Gt. Strand Street in the Holmpatrick area of Skerries. By 1911, still living in the same house, John had left school and was working as a farm labourer. 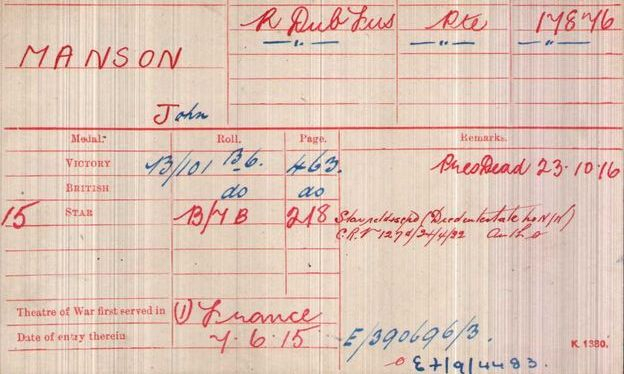 Although John’s papers did not survive the Blitz in WW2, we know from his service number that he joined up on 29 December,1914, and just over five months later on 7 June, 1915, he landed in France and presumably soon thereafter joined up with the battalion. Having taken part in the 2 Battle of Ypres in April/May 1915, the battalion was not involved in any further major actions until the Battle of the Somme. The battalion War Diary reports that on 1 July, 1916: At 9.00am the battalion left it’s assembly trenches and advanced…….immediately after leaving their assembly trenches each line came under a heavy enfilade fire from machine guns in Beaumont-Hamel……at 9.05am the order ‘stand fast’ was received followed immediately by message, “your battalion is not to go beyond English front line trenches until further orders”……at 12 noon orders as follow were received: “you will attack the German trenches and consolidate line”……it was found impossible to collect more than 60 men: during the advance out of 23 officers and 480 men going into action, 14 officers and 311 men had become casualties……the remainder were scattered about the trenches…..the CO was therefore ordered to collect all the men possible and put them in the original assembly trenches. The battalion remained there until 5.00pm on 3/7, at which time they returned to billets in Mailly-Maillet. After a few more days in the trenches the battalion moved to Poperinghe, near Ypres, on 23 July. However, the stay there was brief and by 24 September the battalion was back on the Somme. After a busy three weeks, the battalion found themselves just to the east of Lesboeufs engaged in the Battle of Le Transloy and on 22 October, they received orders for an attack the following day. The battalion War Diary for 23 October states: At 2.30pm the battalion went over the parapet in four waves….no opposition was met within about 30ft of Gun Pits when a heavy machine gun & rifle was met & compelled our leading lines to lay down. They however crawled forward and bombed the Gun Pits and eventually got into them, where very heavy hand to hand fighting ensued, and it was the survival of the fittest….one Coy ‘C’ went straight through the Pits and on to the ‘Strong Point’…. And established a line about 200ft beyond Gun Pits….two Coys ‘A’ & ‘B’ remaining in Gun Pits and surrounding shell holes cleared up….’D’ Coy on the right got somewhat disconnected….& more or less changed direction leaving a gap of about 100 yards….being observed they were attacked by the Gun Pits….consequently the congestion was rather great here & to a great extent the cause of many casualties. However, the majority of the casualties were caused in the hand to hand fighting in the Pits & by MG fire just before getting into them. John’s Medal Index Card states that he was presumed to have been killed on 23 October, 1916. His body was never found/identified and he is remembered on Pier & Face 16C of the Thiepval Memorial to the Missing. 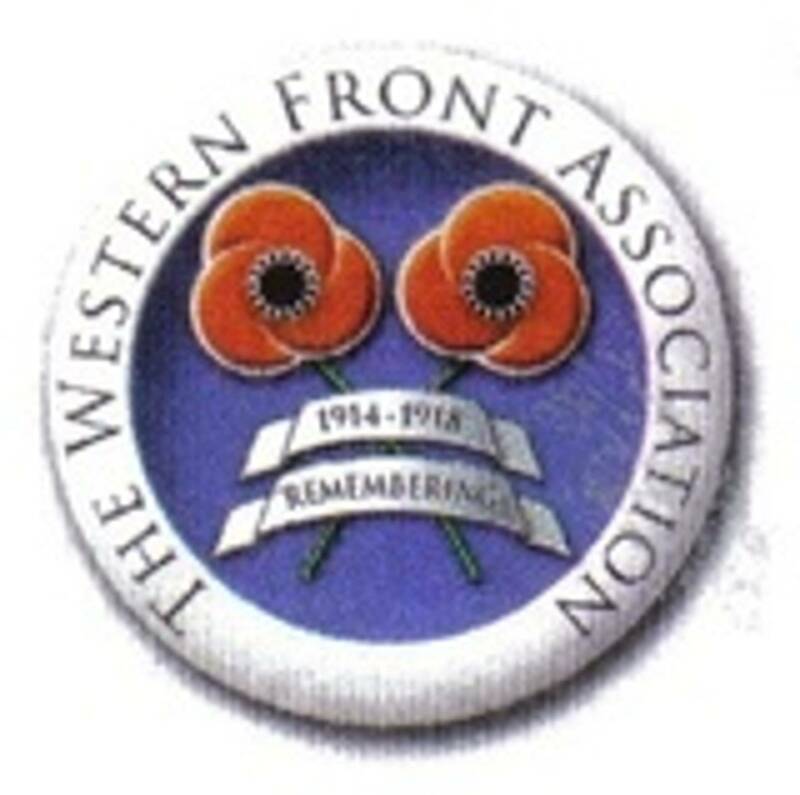 He was entitled to the British War & Victory Medals and the 1915 Star. On the 1901 Census his age is given as 7 and in 1911 it is given as 17, which would mean he was born C1894. The CWGC records his age at time of death as 20, which would mean he was born C1896.